Find out if your students are ready for state tests today! BenchmarkNow! combines the assessment delivery, auto-scoring, and intuitive standards-based reporting features of Naiku with professionally developed end-of-year summative assessments that include a variety of question item types – including technology enhanced – tied to the Common Core State Standards in ELA and Math. With no training or setup required and a flat cost of $0.50 per student for each test, it is easy to get started today. Using BenchmarkNow! is easy – get started with your purchase today by completing this form. We’ll setup your accounts so they are ready-to-go. No training is required to use BenchmarkNow! View the video to see how easy it is to use to quickly learn what your students know, and don’t know, in preparation for state tests. Benchmark Now! uses the Inspect end-of-year summative assessments. These assessments are available in ELA and Math for Grade 2 – High School. Each end-of-year assessment contains a variety of item types and is aligned to Common Core State Standards. View a detailed description of the Benchmark Now! Assessments . We’ve created two sample tests for you to try yourself. Each test is comprised of 5 actual test questions from the full summative tests as examples for you. Click here to take these sample tests and enter the access code followed by your name. Use BenchmarkNow! for just $0.50 per student for each test. There is no setup fee, annual maintenance fee, or other fee. 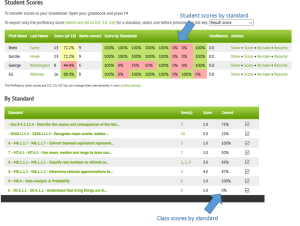 Built-in reports are immediately available illustrating class and student performance by standard. There is no need to export data to a spreadsheet and manipulate for analysis to understand how your students performed. These reports make it easy to understand, monitor, and track student proficiency. Naiku’s metacognitive interactive features of confidence, reflection and journaling are available in BenchmarkNow! Get a deeper understanding of student knowledge and drive student engagement and learning by asking students to rate their confidence and provide justification and journaling of their answers, as well as reflecting on their answers by reviewing automatically supplied correct answers and answer rationale post-assessment.